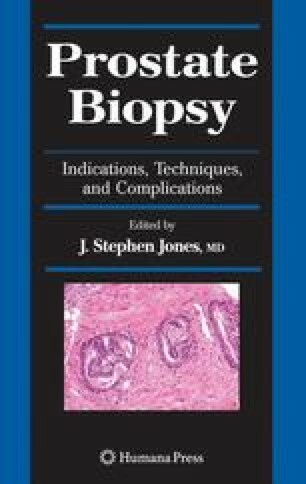 Based on the Vienna nomograms, repeat prostate biopsy is indicated in patients with negative initial findings who have high-grade prostatic intraepithelial neoplasia, continue to have increasing abnormal prostate-specific antigen levels, or prostate volumes >45 cc and/or transition zone volumes >25 cc. The Vienna nomograms evaluate the minimum number of cores based on patient’s age and prostate gland volume required to ensure 90% certainty of cancer detection. The authors found that more than six biopsy cores are needed and that biopsies should be directed more laterally. Location and density measurements suggest that repeat biopsy should be directed in a more apico-dorsal location which is rather spared during initial biopsy. Current data suggest that cancers detected on repeat biopsy have a similar stage and grade distribution and total prostate-specific antigen values compared with cancers found on initial biopsy. Patients younger than 60 years of age need to be counseled regarding higher pain and discomfort during repeat biopsy. Local or topical anesthesia should be offered.